TS Trophy Hunters (mid-rise, side-zip $189): Obsessed. They are definitely the most expensive breeches in my closet, but I think they’re worth every penny. I have them in tan and white and can’t wait to collect more colors. The material stretches where it should, holds me in where it should, and the euro-seat is super flattering. They do get a little baggy in the crotch if I’m not wearing a belt/don’t pull them up enough, but I feel naked without a belt anyways so that’s not a big deal. I may try out the front-zip or low-rise for schooling some time. I can’t find a picture that look like mine. TS (low-rise, side-zip, on sale for $99): Just the classic breeches, though I think the reason they were on sale is because they’re from a defective product run- the knee patches aren’t the classic suede. These do run a little small, but they stay up nicely with or without a belt. If I could have a do-over I would either size up or get the mid-rise since they’re pretty tight on my hips, but it’s not too constricting so I’ll just deal with it- bonus that there’s no sagging anywhere because they stay in place on their own. A little lighter fabric than the Trophy Hunters, but still has good stretch. Got these for a steal on sale and super happy with them. Only negative: the velcro on the bottom hits at a really weird place at the inside of my leg, so I can really only use these with tall boots unless I want weird rubs on my shins. Still can’t find a picture. Do I only own bootleg breeches? 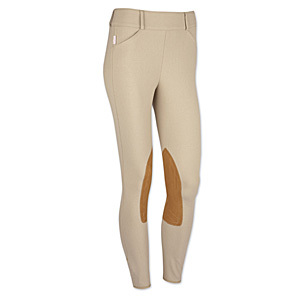 RJ Classics (low-rise, side-zip, $140ish): These are my go-to schooling breeches. They’re a little stiff after I wash them, but once I do some knee-bends they soften up just fine. The velcro bottom hits just right on my leg, and the knee doesn’t bunch up under my tall boots. Showing in these hasn’t been quite right though: my shirt doesn’t stay tucked in because it’s too low-rise. My long-torso self needs to stick with the mid-rise for shows. Image: Dover. Imagine these in blue. Riding Sport (low-rise, side-zip, $70): In case you haven’t noticed yet, I’m a side-zip kinda girl. These are another favorite; I’ve washed them a thousand times with no sign of wear, I ride in them at least once a week, and the slate blue color makes me super happy. They’re stretchy, comfy, and good looking to boot. All that for $70. I would totally show in the tan version of these, that’s how much I love them. Seriously can’t find a picture. These are pretty bootleg though. Fouganza tights (mid-rise, pull-on, $15 on sale): So yeah, these breeches were on sale for $15 and there’s a reason for that. They’re a nice stretchy knit, pretty thick so good for winter. The knee patch is just more fabric so there’s not a ton of grip there. I only ever wear these for riding on my own, never in lessons, and they get the job done. These are what I wear on bath days since I don’t mind getting them wet and dirty and messy. They’re showing a little wear after being washed a bunch, but for $15 I won’t complain. These do not deserve the honor of a photograph. Corduroy full seat (mid-rise, pull-on, depths of a consignment shop): I won’t even dignify these with a brand name because it’s not worth digging them out of the depths of my closet. The suede full seat makes me feel like I’m wearing a diaper and these only make an appearance when I don’t do laundry for 3 weeks and have literally no other choice. Even then I’ll probably end up wearing jeans with my half chaps. Anyone want to buy some terrible full seat breeches? (I don’t think I have a promising future in sales). My question for you, Dear Readers: what’s your favorite breech for schooling? For shows? Anything you would super duper recommend to someone who is 5’9″ and slender? I’m always looking to grow my collection! You know me, I’m a SmartPak Piper girl! I’ve tried other brands of breeches (Tuff Rider, Kerrits, Riding Sport) and none of those brands fit me quite right. I will say that my Pipers do get a little stiff after the wash, but I do some knee-bends like you and they soften right up. I know everyone and their mother preaches about the TS breeches, but I just can’t fathom dropping that kind of money on a pair of breeches for schooling. I do plan to get 1 pair of show-only TS Trophy Hunters because I like how they look, but keeping my schooling and lesson breeches around $80 is good enough for me 🙂 Plus, SP is always running sales, so I usually never have to pay full price! I really need to try the Pipers! The sales are too good for me to have any excuses. The TS breeches are absolutely my showing breeches, and I’ll only be getting a pair for schooling if I’m a very good girl and have to reward myself 🙂 My other cheaper breeches are definitely great for schooling, but I can tell the TS ones are more expensive- the quality really does match the price in that case. I am also a side zip girl. We gotta stick together, because those front zips are taking over! I actually don’t have many breeches at all, and basically only have 3 pairs. Two of them are TS Trophy Hunters in mid-rise side zip, and they are my all time favorite breech. Just wish they weren’t so expensive! At least I’m not the only one still buying side zips! Those mid-rise Trophy Hunters are where it’s at. My poor wallet hates me for loving them. You have a lot of TS! I have one pair, and I like them but I can’t fathom the price. I messed up though, I bought dark brown ones, so now all they will see is schooling. At least I’ll look good practicing! I tried the smartpak bradly’s and those also get all baggy around the crotch, but other than that I like them. I decided to get the pipers, but I haven’t ridden in them yet. Riding in them tonight! Just from trying on though, they seem pretty nice! I already want to collect them all. Today I ordered some neon green ones. I don’t remember what brand, but I have high hopes for them. At least I won’t be shot at while riding in the woods. Haha guilty as charged. You’ll look absolutely fabulous schooling in them! I’d love to hear how your Pipers ride! Did you get one of the fun colors? Ohmygosh neon green sounds AMAZING. I love Ovation breeches. You should give them a try if you haven’t yet. So comfortable! I love the trophy hunters. But if you are tall and thin, you might want to try Ghodho breeches. I have two pair and I absolutely love them! I’ve been seeing those all over Instagram and Twitter and the interwebz and they’re super pretty! Thinking those will be my next purchase. If you do, definitely go up one size from whatever you wear in TS. They are not kidding about the sizing running small. Do you have a comparison for sizing between MR trophy hunters and the riding sports? I saw they offer a MR Riding sport breech in side zip and have felt tempted. Haha the addiction is real! I have the same size in TS and my Riding Sports- the TS fits a little bit baggier in my hip and around the waist, and is slightly higher rise, but not a huge difference in sizing. I would definitely recommend the Riding Sports, they’re super comfy! I don’t get how people are so obsessed with the Tailoreds. I’ve worn a couple different cuts and hated them! I love my RJ Classics, but I hate them at the same time. Since I wore some nice breeches with the new technological fabrics, the old think cotton wool whatever blend is just plain uncomfortable. As far as the crappy full seats go, try selling them to a crafter for an upcycle project! I agree completely- I’m a huuuuuge fan of the newer tech fabrics. I used to absolutely loathe my TSs for that exact reason (along with them fitting super weird and being ugly and a whole laundry list of other reasons) and didn’t even want to try them on in the store, but these newer ones seem to work for me much better. I got spoiled by the Ariat Pro-Circuits I borrowed from a friend and I don’t think I can ever go back! Hahaha. I have the same pair of Riding sport slate blue breeches. Big fan of the color. They are decent pants, but I DO NOT like side zip. Turns out the buckle hits me in *just* the right spot on my hip bone to drive me crazy. I still wear them, I just have to wear a soft belt and leave it unzipped just a tad so the buckle pieces don’t overlap. Haha and I always feel like front-zips hit me in weird places! I’m a big TS/side zip fan for all things fancy, but one of my fav schooling pair is actually a black pair of Equine Couture that I picked up on sale. They are really stretchy and don’t show dirt too badly! While they may gap a teeny bit in the back, it’s not noticeable at all with a belt, or my shirt tucked in. Glad to find another tall riding lady–I’m 5’10” and the breech/velco struggle is real. TGfLB: Tall Girls for Longer Breeches. New club. We’ll make jackets. I’ll have to check out the Equine Couture- I have a show shirt from them that I’m not a huge fan of but I’ve heard very good things about the breeches. I have more breeches than is healthy. My favorite pairs are some of the very old (like seriously, more than 5 years old) high-end RJs they don’t make anymore; they’ve worn ridiculously well and are water/stain resistant. I have a pair I keep just for showing, and then even only occasionally, because I want them to last forever. I just got a few pairs of fullseat Romfh Lexingtons over the winter, and love the fabric (very tech-y and stretchy) and the fit on them, but I don’t have any experience with the kneepatch version. The color on the SmartPak Pipers is cute, and the fabric is holding up much, much better than their original Bradleys, but ugh, I hate how they fit me. Even with a belt, they keep trying to fall off of me. It’s like there’s not enough rise, or waist/hip definition on them. They’re also much lower rise than I’d prefer. Do they still make the Ariat ProCircuits? I have a pair of them that I love, and again, save for shows, so as not to wear out. I bought them on clearance somewhere, so I fear those are no longer being made, despite being awesome; they’re a very close second to my old RJs in my favorites list. If you’re interested in trying Pikeurs, look at Calevo.com. They’re in Germany and the price is seriously less than half of what they are here if they’re on sale. I got two pair of Luganos for dressage shows, shipped to the US, for less than one pair of them at any retailer in the US. I haven’t been able to find my RJs anywhere else , I think I must’ve gotten a discontinued version! Super sad since they’ve been absolutely fantastic. I absolutely love Ariat everything, but have to admit I’ve never tried on their breeches. Definitely going to investigate. I’ve never even thought to be interested in Pikeurs since they’re so out of my price comfort zone, so thank you for the tip!! I’ve heard since buying mine that different styles of the Romfhs fit differently, so definitely give them a try. I really like mine, which surprised me! I was just looking for a few more decent schooling pairs of fullseats, and I liked the ones I bought enough to order another pair. The Pikeur pricetag scared me too, but at the cost from Calevo (I think I paid 99 Euro each?) and by justifiying them for showing, I gave them a try. They are LONG! TS are amazing. Wish I didn’t have to wear anything else. But since I’m cheap, I also like SmartPak Pipers!